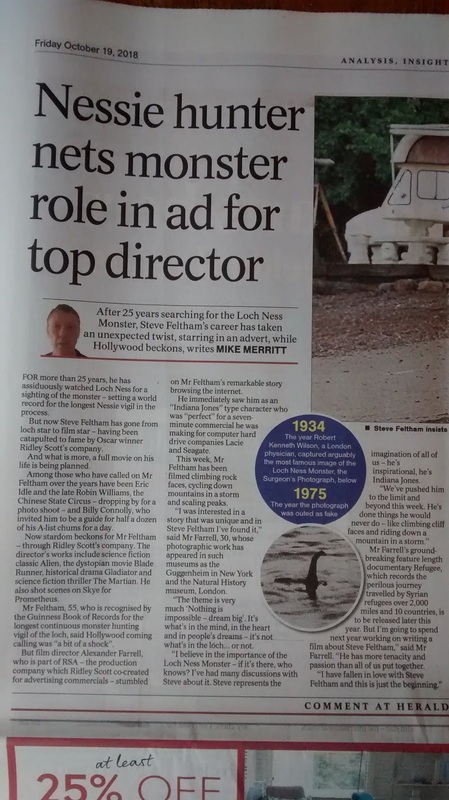 I have been wondering if Steve would ever write a book on his life at Loch Ness in pursuit of the monster, but it appears the film of his life will appear first! According to the Herald, Ridley Scott's advertising company will shoot a seven minute advert of his life for computer hard drive companies Lacie and Seagate with the theme "nothing is impossible - dream big". I look forward to seeing this. It was back at the loch last month as I spent a few days camping and roving around the famous body of water looking for its even more famous resident. I brought the drone, the thermal camera, trap cameras and the old fashioned hand held camera and binoculars. It was also the weekend of the Loch Ness Marathon which kept me off road for most of that day. The extended weekend was a generally quiet time due to the reduced number of tourists who were all back at work and school. However, that had to be balanced against the colder, wetter conditions. So, I may well go back a few weeks earlier next year. Sunday was drone day as I strapped the backpack on and went off in search of a suitable site. Dinsdale Island was now off limits to a wellington boot crossing as it had been during the dry spring. Waders will be required next time as I regard it as a good drone site in terms of isolation and a flat beach for safe landings. A walk around the wider area did not provide any adequate take off points and so I headed off to the location of the Lachlan Stuart photograph a few miles up the road and flew the drone there. 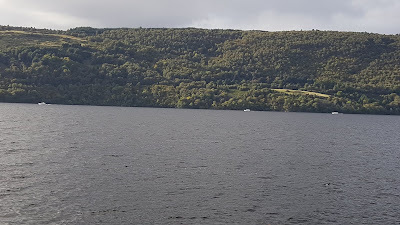 With a nice backdrop of the castle, no Nessie outlines were discerned just below the surface, so I drew a blank (snapshot of drone video below). On Monday it was time to don my tour guide hat as I took fellow Nessie lovers, Phil and Cathie around the loch on a tour of their design and with me as their guide. This involved various stops and chats and so we began at the spot where Peter MacNab took his famous 1955 photograph and heading onto other sites after that. Seeing we are on the subject of Peter MacNab, one sceptic declared some time back that the photo had to be a fake because the black hump didn't look glistening enough as he would expect from water splashing and running off it. So is the photo debunked in one fell swoop? Shall we now consign it to the bin of hoax history? Not if we compare it with an old picture of the Gondolier cruise boat passing the castle in a similar setting. I think you would agree its black, water splashed hull is not giving off much in the way of lustre either. As a side note, if any sceptic tries to gainsay this elsewhere, please feel free to copy and paste their counter arguments here to be dealt with. Stopping at the site of the famous Arthur Grant land sighting, I got my first chance to see the new plaque erected to commemorate that event at the Clansman Hotel. 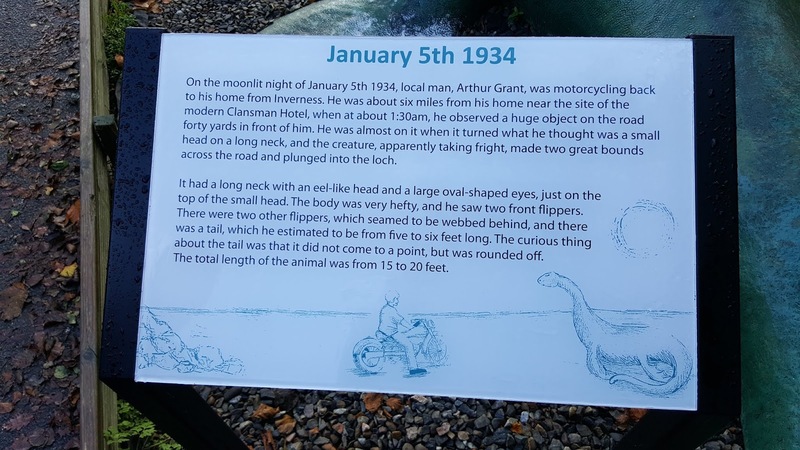 Fortuitously, there was a life size model of the monster there to add a sense of reality to that moonlit night of January 5th 1934 when Grant chanced upon the creature as he approached it on his motorcycle. 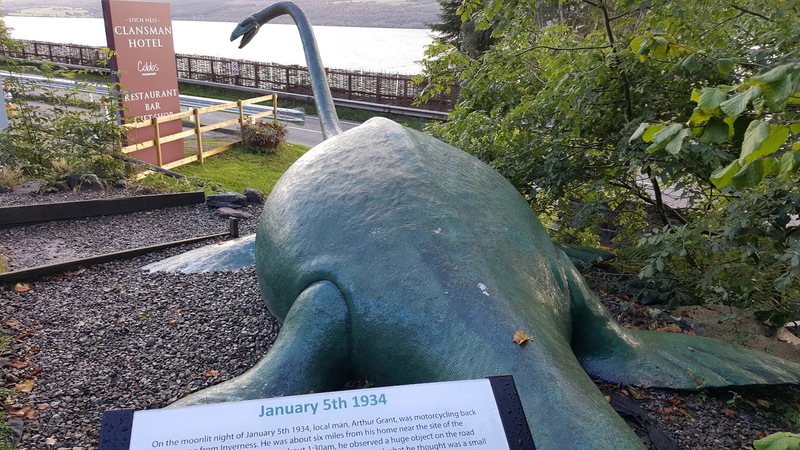 As mentioned in a previous article, I had suggested erecting the plaque to local businessman and Nessie promoter, Willie Cameron. It seems this had always been on his mind and this was the catalyst to get it done. The words you can read on the plaque are the exact words I supplied to Willie, so I was pleased with that. Onwards and as we passed through Fort Augustus and on our way to the southern shore, something was pointed out to me, or rather the absence of something. That something was Kilchumein Lodge, the residence of the Pimleys, from where their employee, Margaret Munro watched a strange creature on the shore of Borlum Bay for 30 minutes through binoculars in June 1934. All that remained was a large tanker of some description with some building materials now lying on cleared land. I recall the house being there on my last visit in June. I am sure some local will help fill in the gaps as to what happened and the site's future. Either way, a piece of Loch Ness Monster history has gone. And here is the old house photographed seven years ago for Google Streetview. Visiting the site of the famous Hugh Gray photograph, the site was being surveyed when an unusual object was spotted rising up and down in the water, which I show below. This was in quite deep water and could not have been a rockbed log sticking out of the water, but after a close inspection with binoculars, it was undoubtedly a large piece of tree debris with a squared off end bobbing up and down in the water. It was presumed that the log had been sufficiently saturated with water to achieve this near submerged appearance with the bulk invisible under the water. 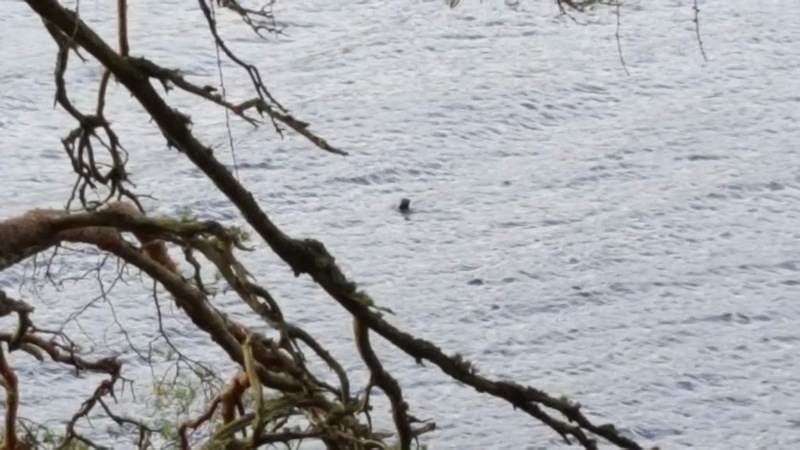 The media and forums often put up pictures of Nessie like logs as if this was some slam dunk explanation for sightings, but the truth is they are easily enough discerned after a short time. 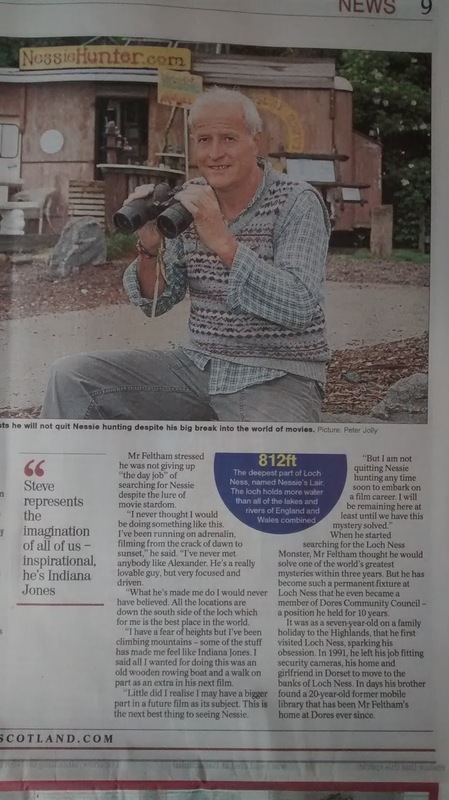 Having said all that, the patience of this hunt of hunts was driven home again that weekend as the drone, thermal camera, trap cameras and good old fashioned eyeball watches produced no decisive evidence. So, it is time to hunker down for the winter and try again next year. Nevertheless, I hope to be back up at the loch with hopefully good news for Nessiephiles later in the year, so watch this space!